As a teaching team we have been extremely lucky to have been successful with our application to the Joyce Barnes Travel Trust. 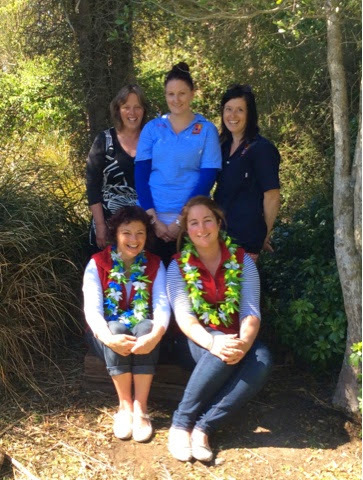 Ashleigh and Tracey will be representing the kindergarten in Hawaii in March .. They are speaking at a conference in Maui as well as visiting Waikiki Elementary School finding out more about the Habits of Mind and our cultural connections as well as sharing our journey exploring the HOM in an Aotearoa context . The panel acknowledged our interest and passion for Habits of Mind and the significant influence of our work over a long period of time and it's potential to enhance teaching and learning across the network. We are very grateful to the trust and NZK for this incredible opportunity. This morning we were lucky enought to have Hanna's Mum spend the morning with us making Chapati. Initially Bhuvika began making some herself and children watched her roll the dough into balls, roll it our flat and then cook it over the hot heat. 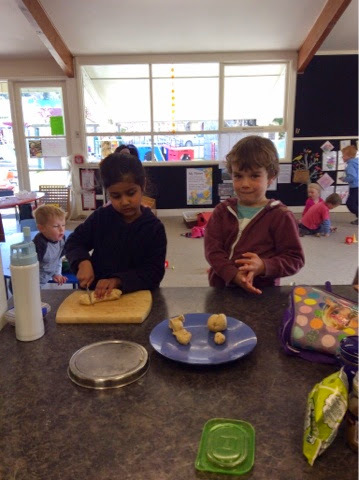 As the lovely aroma of the chapati filled the Kindergarten children began to show an interest and in their own time cut, rolled some dough into balls and used specially made rolling pins to flatten the dough for cooking. The children used the same techniques as they had watched Bhuika use as the prepared the dough for cooking. Jed talked about the different shapes he had made as he rolled out the dough, trying very hard to form a circle. "I made a square, but then I folded the corners in and made a circle" he said proudly. Once the chapati had been made we gathered around the table to try them. As we all sat around the table trying the chapati Hanna took much pride in telling everyone "you need to roll it like this" as she rolled her chapati up. 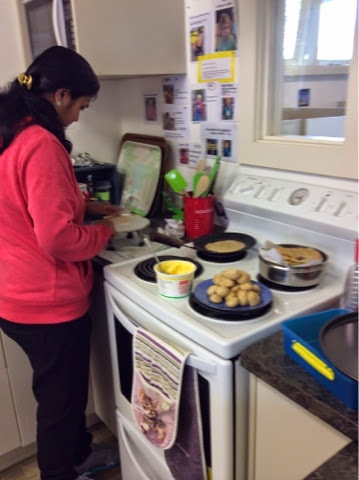 It was a pleasure to have Bhuvika come in to share the making of chapati, something that we know she and Hanna enjoy making at home for their meals. Kia ora mo tēnā - Thanks for that. What does striving for accuracy look like? Well, our afternoon children demonstrated some wonderful examples of showing accuracy and taking time to complete their tasks. Kathy repeated three puzzles over and over, each time practising and perfecting where she placed the pieces. She is learning that practise helps us get better at things. Ka nui ake to matauranga, your knowledge increases. 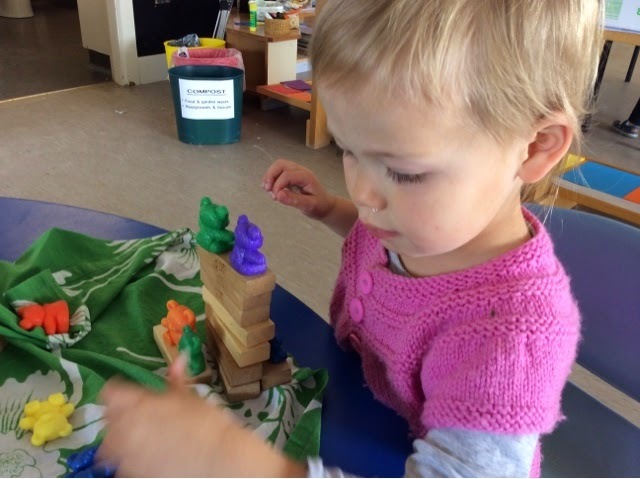 Charlotte took careful, quiet, precession to carefully balance blocks and then even more carefully position teddy bears around her creation. Such concentration! 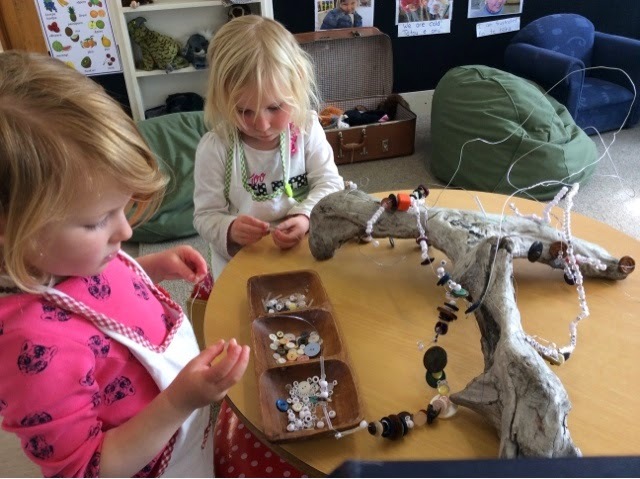 And again such careful concentration from Tyla and Maddie as they threaded tiny beads and buttons onto thin wire for this artist creation. 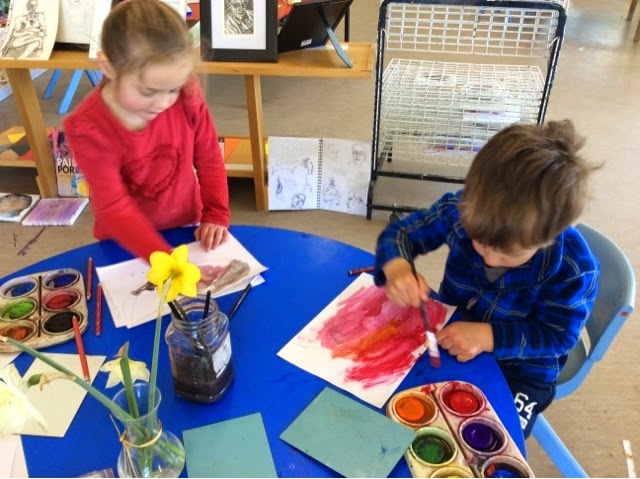 Children are demostrating pride in their work and as teachers we acknowledge, encourage and have high expectations for our children's learning and development. 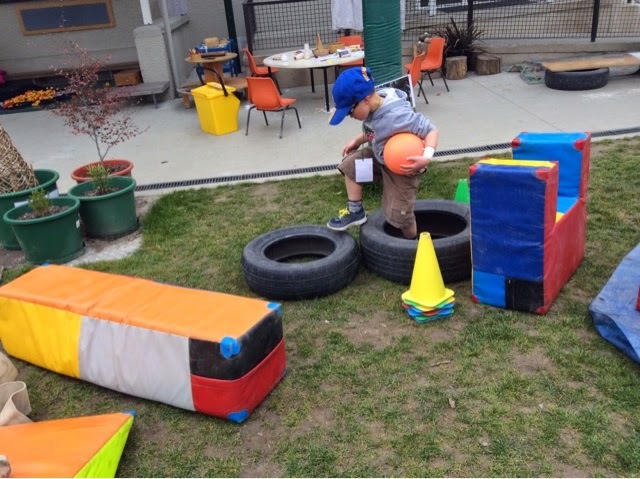 Children can reach their full potential and develop important habits when surrounded by activities that promote this type of learning. Over the last couple of days the children have been taking responsible risks on the slide and bungy jumping! This has been sparked by several children watching sky dive and bungy jumping videos on the iPad. 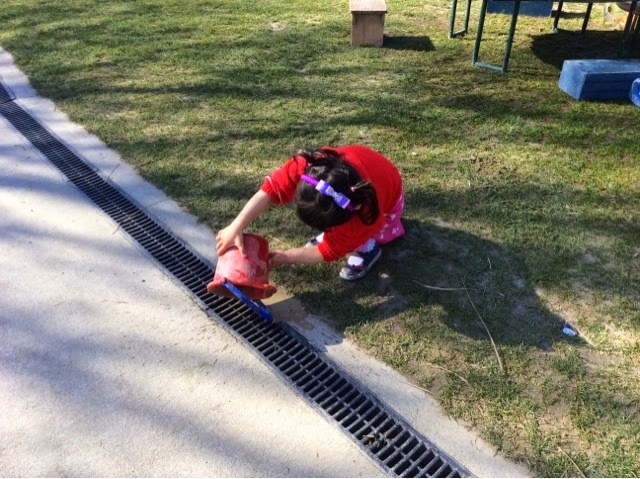 The children have transferred their knowledge of what they have seen into creative play. We looked around for some rope but found a rubber bungy instead. This is very creative, he tino auaha tēnei and shows flexible thinking. 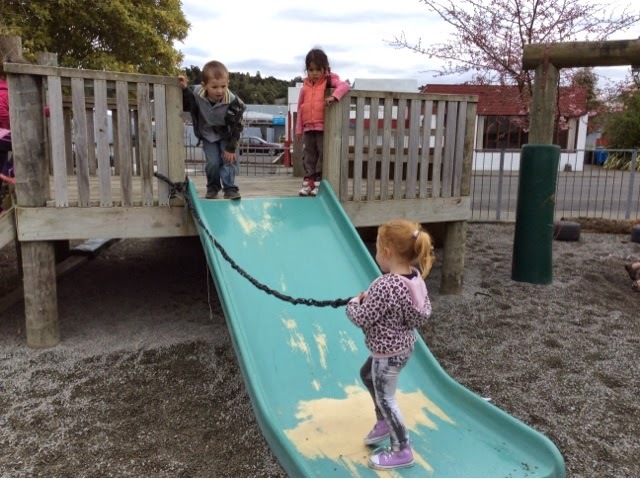 Children worked interdependently by helping each other to tie the bungy cord around each other and turn taking. Decisions about safety had to be made such as where to place the bungy, either around their feet or waist and making sure no one else was on the slide as they went down. This is all part of making responsible decisions around risk taking. 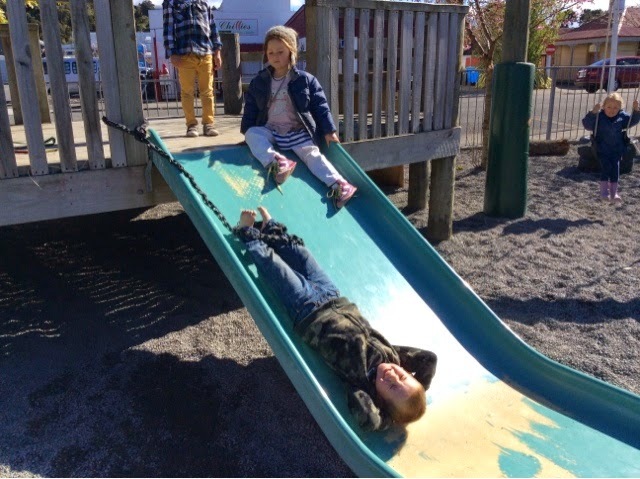 Children were stepping out of comfort zones and being brave! Making a decsion about going feet first or head first was exciting and brave to try! Kia manawanui, be brave! 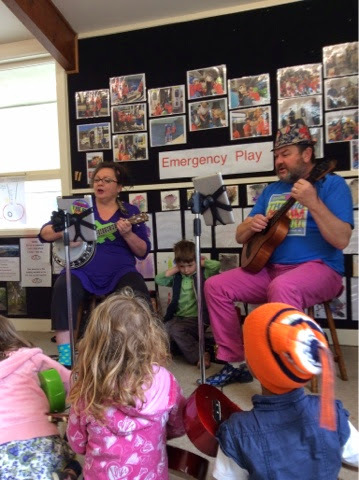 Today we had a wonderful visit from local ukulele players, Fi and Hugh. 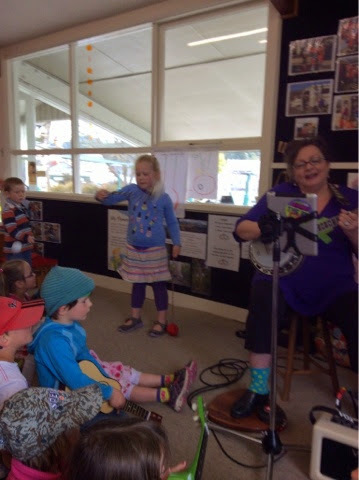 They always come in with great enthusiasm and a great range of songs for the tamariki. Everytime they come, it's always a little different. Today, several tamariki used poi and swung them in time to the waiata/songs. 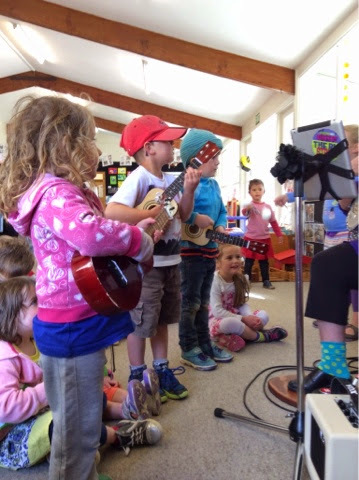 We also had a row of enthusiastic children strumming along with our ukulele and even some drummers at the back. 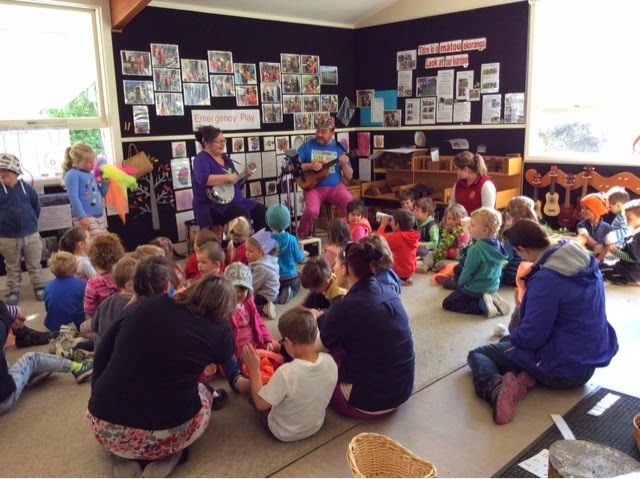 Sharing music is a great taonga/gift and we always appreciate the time and talent that Fi and Hugh share with us. Their creativity doesn't stop there. 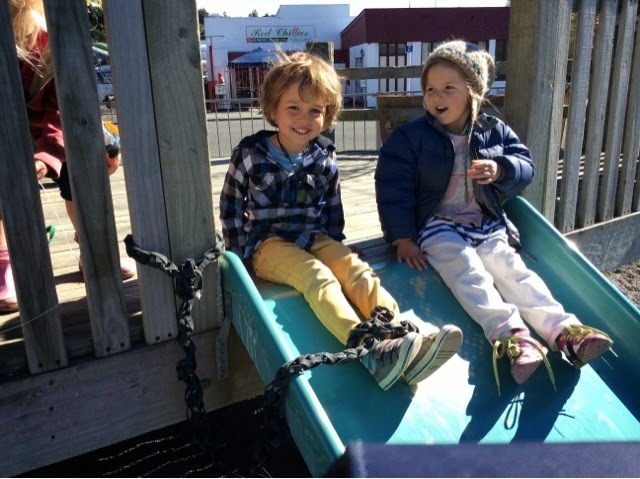 Fi and Hugh are also the faces behind the design and production of "News and Views" our Geraldine Kindergarten magazine. So we thank them both for enriching our daily programme when they visit and for their contributions to the Kindergarten. ka ora ai te iwi. 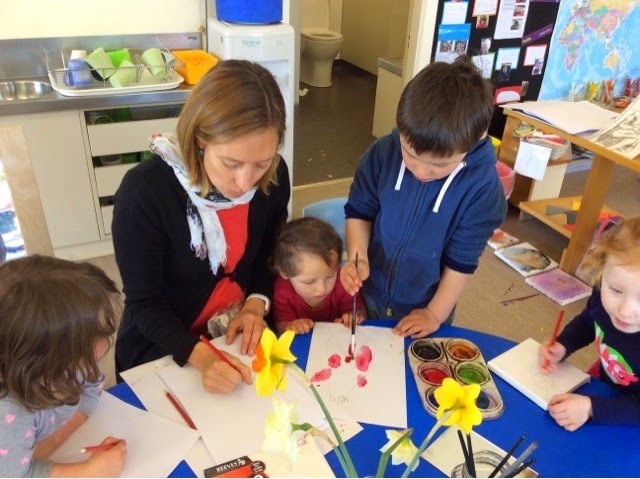 This week George's mum, Rebecca, came in to take a workshop on self portraits. Rebecca is a wonderful artist and brought in her art work to show the tamariki. 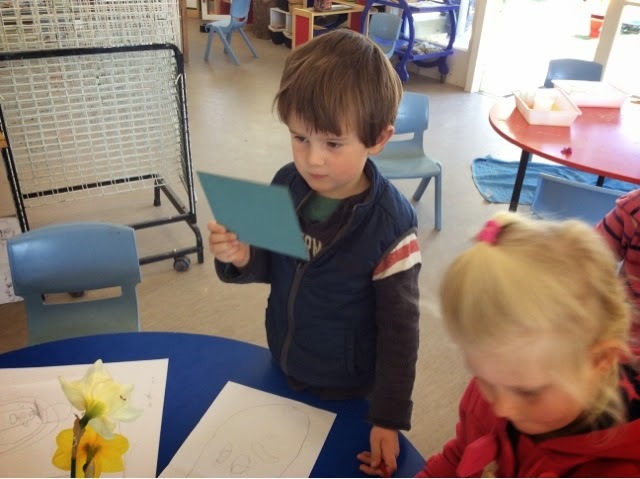 The children used mirrors to study their unique features and transfer what they saw onto paper. 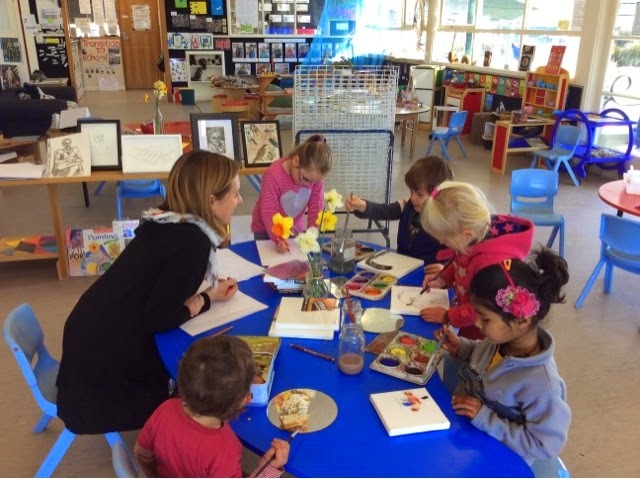 Everyone practised on paper first before having a go on a canvas with water colours. Rebecca asked the children to look for shapes they could see in their faces. Ovals and circles were the predominate shapes. She discussed how eyes have an iris and a pupil and the children had to stop and think carefully as they drew these features. We value whānau bringing in their expertise. 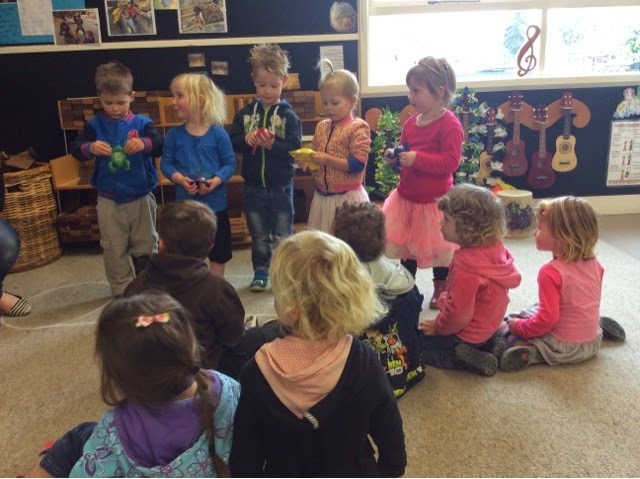 It encourages whanaungatanga/relationships between kindergarten and home. 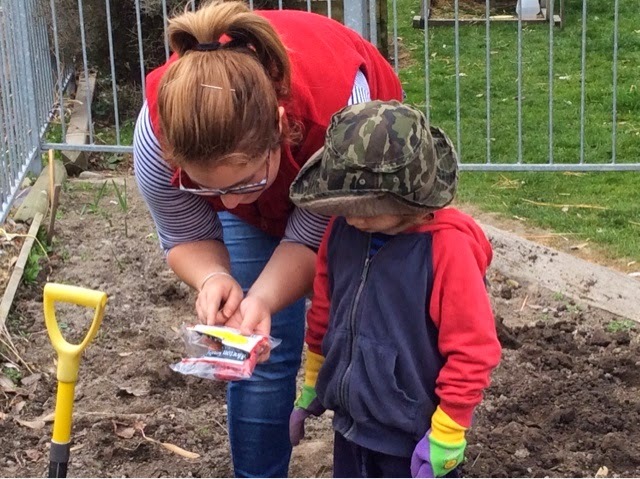 Children learn in an environment where their unique skills are valued and families gain a sense of belonging when they are invited in to share their culture. Kia maumahana tau mana ake. Remember your uniqueness. 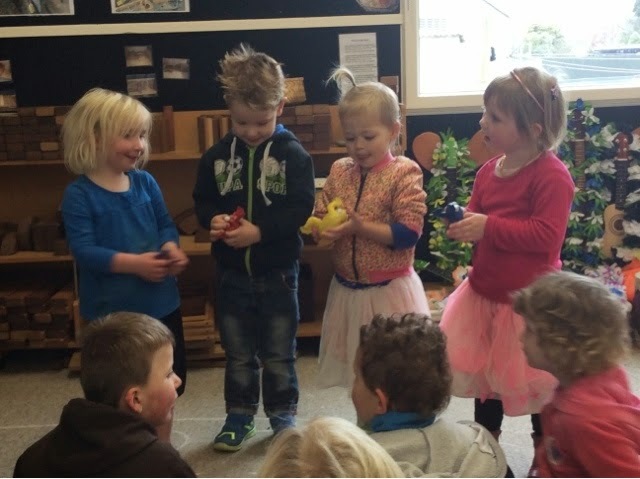 At the end of the day our afternoon children explored number ,counting up to 5 and counting back using the fun , interactive song " five little speckled frogs"
It required us to manage our impulsivity because having a turn immediately was everyone's priority. 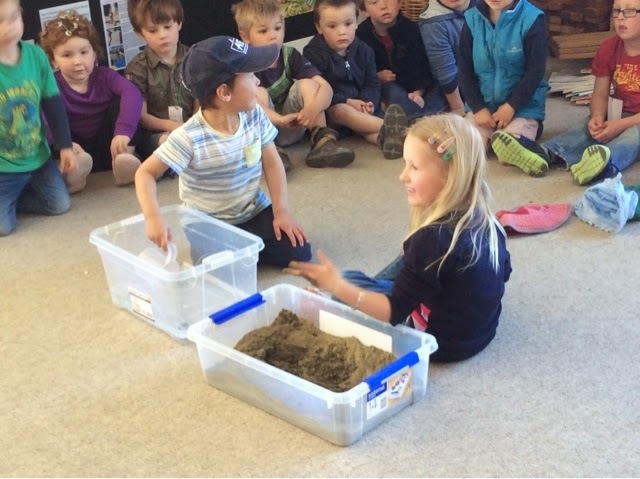 We also worked together problem solving , working out and predicting , if one frog was removed how many would be left .He kaha koe ki tatauria, you are good at counting ! This morning our expert gardener, Billy lead the organisation of a quick trip to the garden centre to purchase some vege plants . After a group discussion predicting what we may be able to purchase ,we were off. Mr Burrows showed us around and what was available to plant and we finally decided on yams, radishes,carrots ,snow peas and celery. All are vegetables that we will be able to nurture and grow with manaakitanga and share the eating of at Kotahitanga. 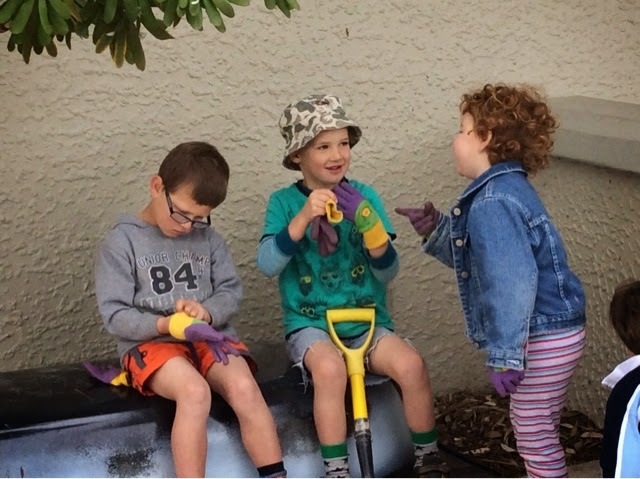 When we returned to kindergarten our first job was to persevere with the gardening gloves, a real challenge that took some time to accomplish but with the support of friends and lots of humour we had success. Tu meke! 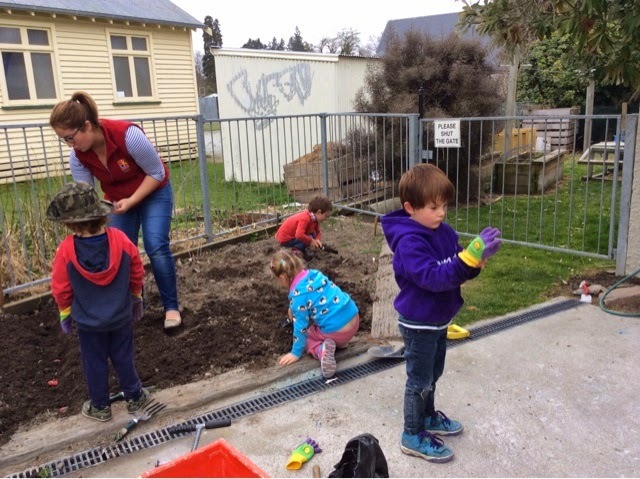 We listened with respect to our friends who clearly had gardening experience to hear their suggestions for planting and then we all took responsibility for contributing.Kua mahi taha, you have worked hard! We are looking forward to summer and eating our yummy veges. Watching 3year olds playing with water! 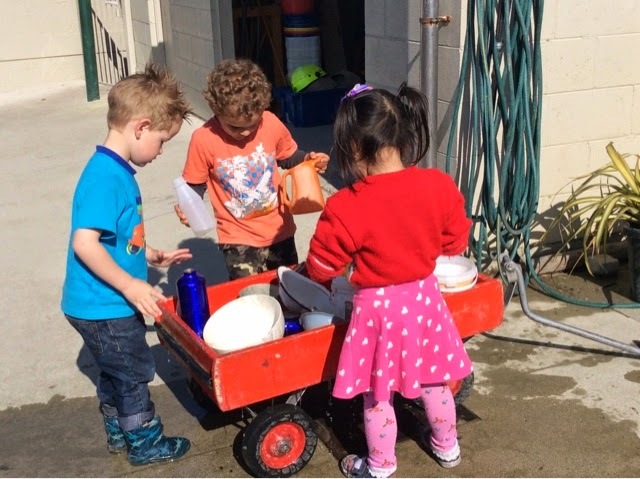 When water was found in the playground Caleb found it a wonderful opportunity to fill all the containers with water and transfer them to the sandpit. He returned to the same play again this week and others joined in too. 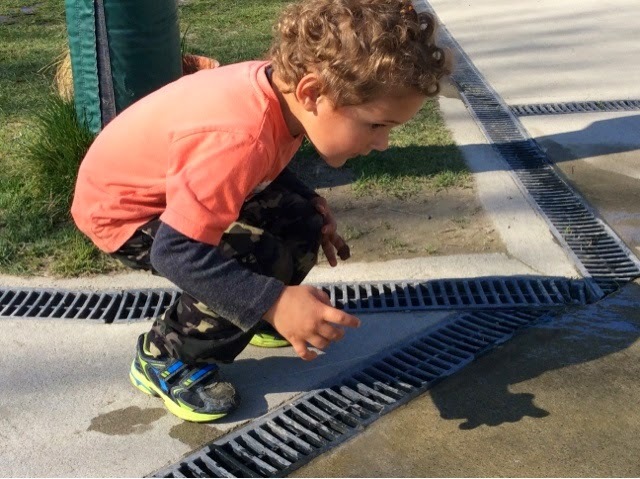 ...Mitchell saw the water flow down the drain and then found another use for the containers of water! They poured the water into the drain and followed the flow until it stopped. 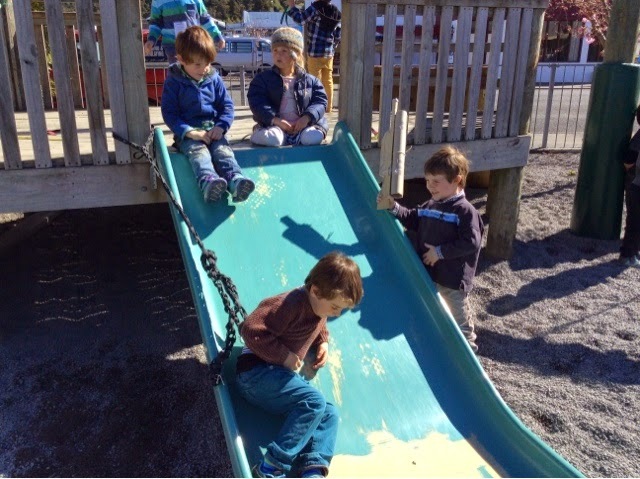 The small group were engaged in the play for quite some time as they found space to explore on their own but at the same time follow one anothers lead. This is typical of 3 year old play, finding out about their world. 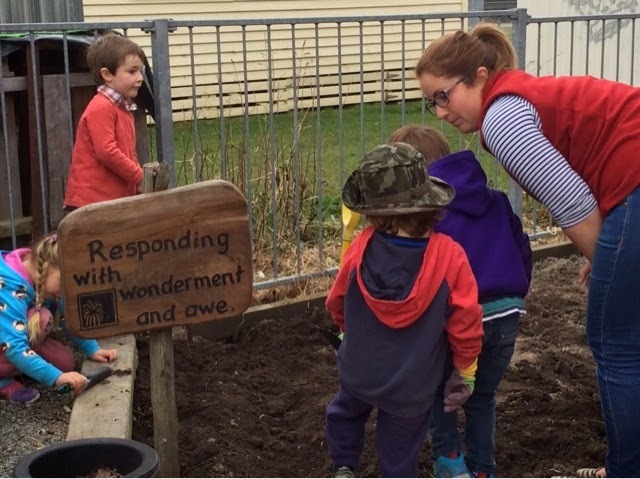 Working alongside each other through shared experiences is providing the children with a growing sense of belonging. The picture is superb, pai rawa atu te pikitia ra! Tracey introduced a story at end of the day about a 4year old girl who had to persevere to tell her peers about being responsible. She used a very effective strategy for children to see what perseverance looked and sounded like. 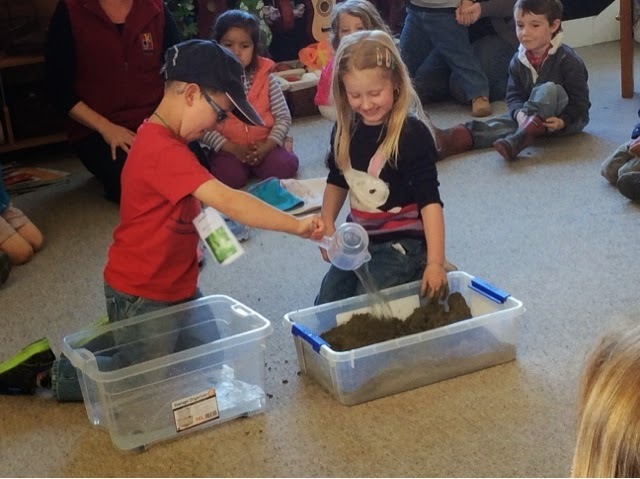 Ruby was in sandpit and Lance came along with water from the trough. (Lance agreed to be the boy and chose a hat as part of his costume). Ruby said, "Lance, that water belongs in the water trough! After morning tea we will have water in the sanpit." Lance grinned and then another friend arrived with more water from the trough and Ruby had to repeat and explain again. And AGAIN! Ruby didn't give up! Success was coming! The children enjoyed being actors as there was no shortage of volunteers coming forward! Tracey acknowldged Ruby being a perseverer because she kept saying the same until she got the result she desired. Tino pai Ruby for being the 'true blue girl' in the story - tumeke! 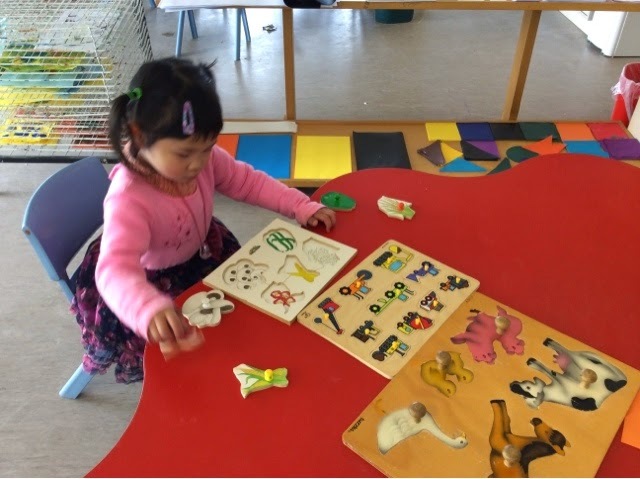 Tracey has made a story book and placed photos and story on the wall for the children and families/whānau to revisit on there own or together making a rich literacy experience. "Can I have a turn?" 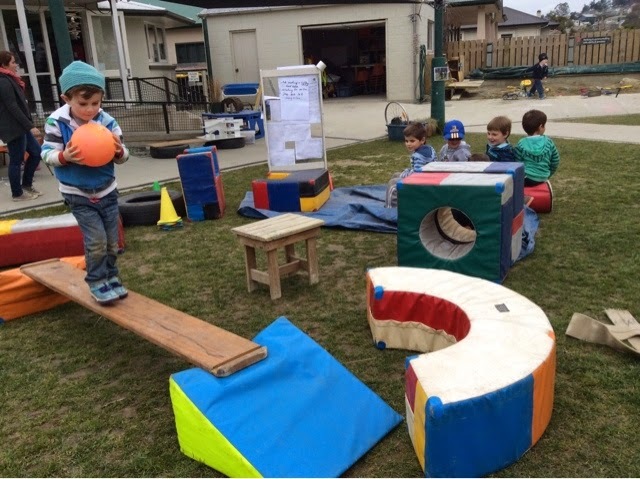 It began with the boys making a cannon for shooting and then they became the cannon balls firing around an obstacle course! "Fire! Cannon balll 1!" And off they would go one by one. James made his way through the beginning of the course. We decided to make it a bit more complex by holding a ball all the way around. Wilbur stepped carefully across the wobbly bridge! 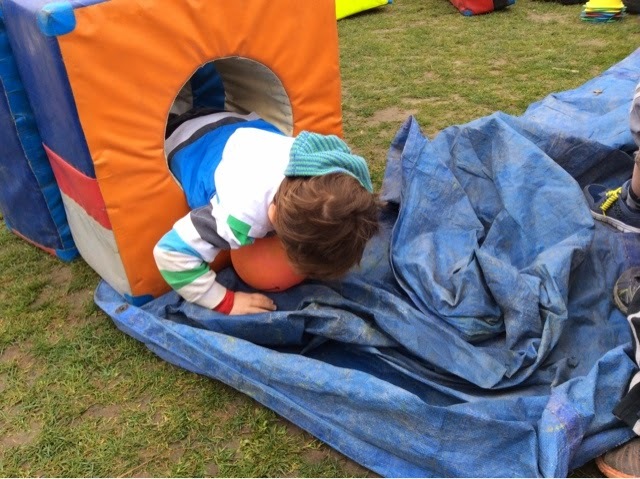 And then through the hole to pass the ball to the next cannon ball! 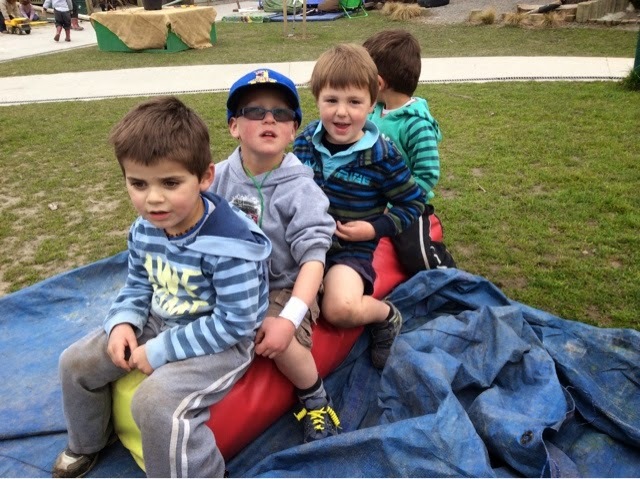 The boys enjoyed trying new ways around adding to an increasing level of difficulty. Kia kaha nga tama!